Sending our savings to India is very important for all of us. Best rate and immediate service is what we all look for. After the implementation of online payment facility by various money exchange companies in Kuwait, Al Mulla Exchange company become the first to launch a mobile application for transferring money from our mobile phones. This is the first mobile application by an exchange company in Kuwait. 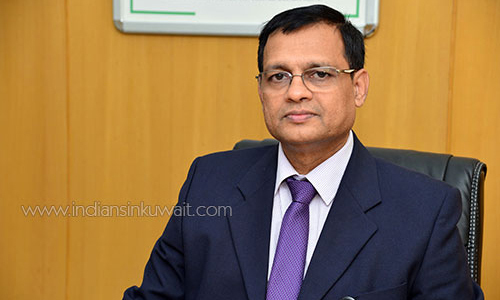 In an exclusive chat with Indiansinkuwait.com, the Divisional General Manager (Exchanges) of Al Mulla Group Mr. Praveen Singh explains the various features of Al Mulla Exchange Remittance app and other services for expatriates. IIK: What was the idea behind launching the mobile app for money transfer? PS: It is the mobile age and people are on constant move. We see that a mobile remittance application is the right solution for customers who want anytime anywhere remittance facility. It is a big step towards digitization. Whenever our customers need to remit money, they don’t have to wait or need to reach to the branch or open even their computers, all they have to do to take out their mobile phones and the remittances are just a few touch away. It has been our constant endeavor at Al Mulla Exchange to enhance our customer experience, expand the relationships and deepen engagement with them. Our Al Mulla Exchange Mobile remittance app is available for both android and I-phones and it is the best solution today for a person to transfer the money online from their mobile phone. IIK: How was the feedback from customers for this app? PS: Our online remittance platform and Mobile Apps have been well received and accepted by them. Based on our customer feedbacks, we have revamped our online portal recently to offer larger number of products. The menu navigation is more simplified and now more easy and customer friendly. The feedback has been very much encouraging. Since the launch of the Mobile remittance app, we got tremendous responses. There are a lot of appreciations from our customers. This has helped us acquire new set of customers and helped us in enriching our customers’ experiences. Customers’ familiarity with our online remittance portal made the transition easy and smooth to the mobile app. We are also receiving suggestions and ideas from our customers which we are working on and would apply in due course. IIK: What are the unique features of this app? PS: Through this app, we cover the time and distance. All our remittance services available at the branch through our various API integrations are also available to customers through online and Mobile app. Our service delivery propositions such as 3-minute remittance, SMS notifications, etc. are seamlessly available on this app. also. This is an intelligent app. For a user, the registered beneficiary details appear automatically on the screen and you don’t need to type it again. User can also add a new beneficiary from the app itself. This is a new feature recently introduced. Earlier people need to go to the branch to add a new beneficiary. But now this is possible from the mobile app itself. We are also having push notification for latest rates updates and other currency movements. This helps the customer to take appropriate action regarding their money transfer. This will help them to plan their remittance accordingly. We communicate the exchange rate fluctuations to our customers and this is an engagement tool with our customer. IIK: Is there any difference in the rates for those sending money through the app compared to your branch rates? PS: Yes. We always endeavor to offer a better rate for our customers who do online/ Mobile App transactions. This is a kind of incentive for them for using our online facilities. Also our mobile app is designed in such a way that if there are differences in rate offered by different banks, the app will give them suggestions of better rates. IIK; Is there any limit for sending money through this app? PS: There is a limit of up to 10,000 KD for sending through using Online channel. IIK: How easy is it for a layman to use your app? PS: Our mobile remittance App is extremely user-friendly, easy and navigable for a layman. Once you download and login, the list of registered beneficiaries would appear for you to choose. If you want to add a new beneficiary, the features are also available. You can also see your past transactions. IIK: What are your future plans to improve this app? PS: Even though there are lot of features currently available in this app, we always believe that there is a scope for improvement. We are adding geo-location feature also on the app. Now all our branches are getting google verified. This will help the customer to reach to the nearest branch. Many feedbacks are coming from our customers who are using this app and we will be updating the App. It is a continuous process. IIK: You are offering one of the luxury car 'Alfa Romeo' for your online users, which is unique in this industry. What is this contest all about? PS: We are running a mega promotion for our online users till August 13th. This is a mega draw and the idea was to do something to bring the WOW! feeling to our customers. We would like our customers to exclaim with joy - What a car! What an app! We want to bring lots of smiles on the face of our customer. This campaign is for digital channel. All the online customers who do a transaction either through the online portal or through the mobile app will be entitled to enter the draw. Whenever you are doing a transaction, you will get a chance to win. Higher the number of transactions, more are your chances. For transactions done at branches, we have other regular campaigns. IIK: Do you think this app will replace the physical branches? Al Mulla exchange is now popular among the community. How many branches you have? PS: We see digital channels such as online as complementary to our Brick and Mortar services. It increases the reach of customers and enriches their remittance journey. It truly empowers them. Online is a customer service channel whereas the customer acquisition takes place at branches through face to face interaction. Our branches provides us the geographical spread and currently we have 81 branches and still expanding. We are the first exchange house to open four branches in a day. We are expanding our presence in key locations. This will continue. In our branches, we have various facilities for our customers. Insta Remit kiosk at the branches are also an additional service for them. It is available at almost all branches. Many people are using the kiosk at branches and have expressed their delight in experiencing the self-service mode. This has improved the Turn Around Time (TAT) in the branches. Customers need not go to the counters. They can go to the kiosk and put their Civil ID card to start the remittance. They can put their currency notes in the slot or use their K-Net card and do the remittance. The kiosk will even return the change if you don’t have the exact amount. We don’t charge anything extra from our customers for these services. IIK: What makes you different in the Money transfer sector in Kuwait? PS: We take lot of pride in bringing delight to our customers. Our motto has been to “to beat customers’ expectations, not just meet them”. Our endeavours have been to add value to our services. Speedy delivery, timely execution, diversified product portfolio, consistency of high quality service are some of the key features which sets us apart from competition. Reliability and safety has been our hall mark. Innovation and technology has been our two pillars of strength and we believe in constantly evolving towards meeting customers’ needs. Among value add services, we provide loyalty points to customers on remittances. We offer free insurance coverage to remitters. Our own notification system sends SMS messages to customers and helps them to track their remittances. We also bring large customer engagement programmes through entertainment shows. The idea is to make them happy and engage them with Al Mulla Exchange. These value add services are totally free for our customers and we don’t charge anything. IIK: What is your staff strength and future plans? PS: Currently our staff strength is approx. 700. We are expanding and increasing our customer base. We would be active on the digital front and bringing many new innovations. Mr. Singh, with more than 30 years’ experience in the banking industry, is heading the Exchange operations for Al Mulla Group Company in Kuwait and other countries. He has been with Al Mulla Group for the last 10 months and before joining here, he was Chief Financial Officer (CFO) of SBI Card – a Joint venture between SBI and GE Capital. Hailing from Bihar, Mr. Singh has worked extensively in different areas of Banking at SBI in their India, London and New York Branches. Since last ten years, he has been actively involved in development of the different streams of Cards and Payment systems in India and abroad. I was excited when I heard about this APP. I downloaded, activated by visiting the branch. All good but the rates are higher compared to other exchanges and 1 KD charge is also higher. So not very satisfied, Will send through other exchanges unless its very urgent and cannot go out to any exchange. Government employees are better than al Mulla sales representatives, transferring customer from one counter to another. Worst customer service in store as focusing more on app. I could not register my Civil ID due to some IT error (as informed by the staff in one of the branches). Would you please extend the draw dates? Dear Mr. Khalid, Thank you for your query. Our Remittance App as well as Online has the option to send to Pakistan. Please call our helpline number 2205-7194 and we will be glad to assist you. Dear Ms. Nazneen, Thank you for your query. Opting for going online with Al Mulla Exchange is a great decision. If you are a regular customer of Al Mulla Exchange, you can register from the comfort of your home or office and there is no need to visit the branch. The steps outlined will guide you on the registration process and the password will be subsequently generated. Please call our helpline number 2205-7194 and we will be glad to assist you in your registration process. I am your existing customer. But never tried online. Can I use it directly? where can I get my password? I downloaded your app. But I cant find any option to send to Pakistan???? Only thing most of your branch staff are very arrogant, they think they are doing this service for free or they are doing a favor by doing transaction. if transaction delay ask them no body want to take responsibility to reply from branch. Head office and customer care are very much helpful, very quick to respond and solve the issue.mostly domestic workers they are not educated, try to be polite ask them calmly what they need and how can you help them. I hope most of them agree with my comments. Good app. I am using it for the pas two month. It is very good. Thank you for your query. Sending money from anywhere across the globe is a great feature of our App as well as online. All you need to do is to just activate your roaming while travelling so that you receive the OTP on the mobile from Knet. Thereafter you can complete the transaction on Knet by putting in your details. Another advantage of our online/ app is the ''Add beneficiary'' feature by which new beneficiaries can be added. We are at your service for any queries you may have. I used this app for the past two transaction. It is good and user friendly. Thanks to Al Mulla Exchange for this app and wish you a good luck. Good Idea sir G - your marketing team had done good job-all credits goes to them for this online transferred app-but there is only one problem that we cannot add new beneficiary name as we have to visit nearest branch. your branch staff need little training for dealing with customer as some of the branch staff do not speak in good manner staff should soft spoken in this daily competition market. May i ask some question to Mr Praveen singh you are right about digital payment transfer agreed but you only enlighten transfers you made it easy and also transfer at very reasonable rates. In India it is going on long back, by banking institutions what you are doing is not new. But my question to you if we transfer thru your app what guarantee is there the money reached, you will say you will receive sms messages. Now if i send money thru your apps and the money i transfered thru your app debited my acct but did not received by the beneficiary and i receive sms of debited my acct but money not received to beneficiary in this case how you solve your problem. Banks in India are facing this problem and they reverse their acct after three months or in some cases they say transactions is successful. Now if expriate is leaving the county and if he faces this problem how you will solve you did not explain in your above news. By the way digital payments are not safe and secured yet so many peoples dont know how to send or even call on their smart phones so i feel technology is very good not for all but for few who can understand the basic of transfers of money thru digital mode. Can you please confirm the availability of this service, for indian nationals who were on vacation. Can we use this application for transferring money to our bank account with our Kuwait ATM card, while we are in india for vacation. The service is good. But the rate offered is not competitive. Other exchanges are giving better exchange rate. Also, another thing is the 1 KWD commission charged. Again, other exchanges are taking as low as 0.700 KWD only.